A specially machined bridge with adjusted scale lengths to improve intonation for capoing and playing up the neck. Maple with notched ebony top. 5/8" height; 1-11/16" string spread. After spending a couple years learning on a 60 year-old Kay starter banjo (which stays perfectly in tune), I decided it was time to upgrade, and bought online a new Deering Goodtime Americana openback. Besides it having factory-caused fret problems that had to be resolved in the guitar shop, I could not get this brand-new banjo to sound right. The middle string was extremely sharp when fretted, even at the 2nd fret. I was beginning to regret wasting my money on this beautiful but dissonant banjo, until a little research revealed this is a common problem that can be alleviated with a compensated bridge. I bought this bridge, installed it, and wow, does it make a difference! I can actually play songs without wanting to cry. I hope other people experiencing this same problem make the same discovery. I wish my banjo books had mentioned it. Bought this fix the intonation problem on my Deering parlor banjo's third string. Put it on, tuned it up and it now sounds great. I haven't put the bridge on yet, but it is going to be just what I need on the banjo I'm fixing up. I am very pleased with the consistency the bridge gave me up and down the neck. I purchased this bridge to replace a missing one on a friend's banjo that I am doing a restoration on. 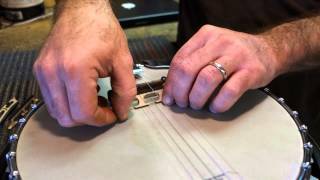 It is a great alternative to a straight bridge, and gives better intonation to the banjo. The title says it all....good quality and decent intonation compensation at a great price.